Web Enabled ERP Solutions India, Web Enabled ERP Solutions Mumbai, Web Based ERP, Web Based ERP India, Web Based ERP Mumbai, Web Based Software, Web Based Software India, Web Based Software Mumbai, Web Based Software Development, Web Based Software Development India, Web Based Software Development Mumbai, ERP Solutions, ERP Solutions India, ERP Solutions Mumbai, Web enabled erp, Web enabled erp India, Web enabled erp Mumbai, web enabled application,ERP Development, ERP Software, ERP development Company Mumbai, ERP Web Integration, Web Based ERP Software, Web Enabled ERP Solutions, ERP solution providers, Web Enabled ERP Solutions. Sales Department deals with registering Enquiry of the Product, Sending Quotation and doing the Quotation Follow ups and sending the goods to Client by making Sales Challans and Invoice. Sales Module has Enquiry, Quotation, Quotation Follow Up, Client Sales Order, Sales Challan, Sales Invoice, Auto Sales Invoice, Order Cancel/Close, Challan Return, and Sales Invoice Return & Sales Service as Sub Modules. Sales Enquiry : All Enquiries coming from various sources can be entered in the system. Nature of Enquiry, Basic Client Details, and Product Details can be entered. Quotation : Quotation of Individual Products or Finished Parts with Assembled Items can be made from the system by entering various details like Client Details, Terms and Conditions, Discount Structure etc. Quotation Status and Follow Up : After sending the Quotation to Client, it can be followed up in the Quotation Follow Up Module along with Reminders and Status of the Quotation can be maintained like Open, Closed, Order Cancel, Order Lost With respective comments and reasons for better Analysis. Various types of Quotations can be made from the System and Print Formats with various permutations and combinations can be derived and achieved from the System. Sales Challan : This Form is used for issuing products to client on Challan. It can be a Direct Challan or through Client Sales Order. If from Client Sales Order, Pending Quantities to be given to client can be tracked through Sales Challan. Products can be also selected and dispatched to Client Directly. Sales Invoice : Depending on which Sales Book the admin has created, multiple options of the Sales Book can be viewed on Clicking on Sales Invoice. Series of the Invoice can be maintained accordingly. Invoice can be prepared from one or many challans. Client Name and other details can be selected from Master so that the pending Challans are populated. Agent/Broker Information and Sales Person Info is also populated. Details like LR No., LR Date, Dispatch Through, Document Through, Preparation and Dispatch Date and Time, Transport Details, Product Details, Selection of Terms and Conditions, Tax Structure with Final Discount and any additional plus/minus charges. Final Total and Conversion in Words is auto from the System and Comments can be put at the end. Also Dispatch address can be also populated or mentioned. 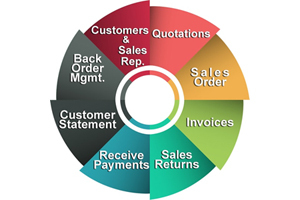 Various types of Sales Invoice Print Format can also be given. Auto Sales Invoice : DreamSoft ERP also offers you Auto Sales Invoice Facility so that user don't have to prepare individual Invoices for each Client separately. It can be done in Auto Mode. Order Cancel/Close : Client Sales Order can be Short Closed or Cancelled from this Form. Challan Return : If Invoice is not already made then Challan Return Form can be used to take back full/partial Product Quantities from Client effecting the Inventory in store which it comes to. Sales Invoice Return : If Sales Invoice is already made then this form is used to receive the Goods back from Client. This will effect Inventory as well as Accounts. Sales Services : All different Services apart from Products to be billed to Client in different Sales Book of Accounts will be entered in this form.